Should We Honor Confederate Ancestors on Memorial Day? Many of my 4th and 5th great uncles died while serving in the Confederacy. This is difficult because I vehemently oppose the Confederacy’s ideals and what they were fighting for. I condemn their way of life and how they built their economy on the backs of enslaved people. I abhor their plan to rebel against my beloved country to continue their practice of treating people as property and ripping their families apart for financial gain. I am glad the Confederacy lost and I would have fought for the Union if I could go back in time. So, I found myself asking this question, “should I honor Confederate soldiers on Memorial Day? 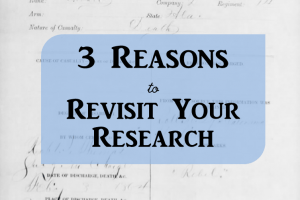 And how can I possibly do that?” I wrote about my solution to honor them by viewing their lives objectively and learning about their experience at The Genealogy Reporter. On Facebook the article received some backlash. One commenter felt that because Confederates were traitors to the U.S.A., they should not be honored on Memorial Day. Any other day, it’s ok to talk about their experiences, but not Memorial Day. I understand that point of view. I researched the question again and came to a different conclusion. Here’s why. 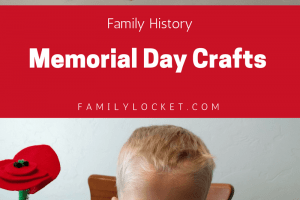 The origins of Memorial Day (formerly Decoration Day) are controversial. Over two dozen towns claim to be the source of our modern Memorial Day observance. An article in the New York Times tells about four women of Columbus, Mississippi, a hospital town and burial site for both Union and confederate dead, who decorated the graves of these soldiers on April 25, 1866. According to the U.S. Department of Veterans Affairs, the first observance of Decoration Day in 1868 after John Logan’s declaration included “strewing flowers on both Union and Confederate graves, reciting prayers and singing hymns” at Arlington National Cemetery. (More about the Confederate dead buried at Arlington in the next section). James A. Garfield, at the time an Ohio congressman and major general of the Civil War who became the 20th president in 1881, gave a speech that day, honoring the valor of the Union soldiers. Today, in Arlington National Cemetery, a small American flag is placed on each grave for Memorial Day. Do the Confederate soldiers receive the same honor? Are flags placed upon their graves? In my search, I came upon an article at CNN about Shiloh National Park. They honor Confederate dead with American flags for Memorial Day, saying that “over the past 150 years Confederates have come to be considered American soldiers.”[vi] Yet someone came to the park and removed the American flags from the Confederate graves. The park’s Facebook post about the controversy and the subsequent comments show the divide in the country that exists even today about how to honor Confederate dead and the use of the American flag and Confederate flag. A small Confederate flag is allowed to be placed at Confederate graves, according to National Park Service regulations, on Memorial Day and Confederate Memorial Days (as celebrated in some Southern States) along with the U.S. flag. One of my Confederate relatives, Charles Baldwin Royston, is buried at Arlington National Cemetery, in the Confederate section. I was quite surprised to learn of the existence of this section. It consists of a memorial, unveiled in 1914, and graves of over 250 Confederate dead arranged in concentric circles around it. Although they were traitors during the Civil War, many veterans of the Confederacy fought for the United States before the Civil War and went on to fight for the United States in future conflicts. 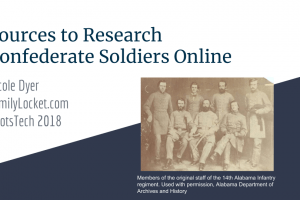 Their lives were not defined by their service in the Confederacy, but they were complex individuals who were influenced by their time, location, and family. They made their own unique choices. We are not their judges, yet we can learn from them as we learn about their lives. As mentioned before, some Southern States choose to honor their Confederate dead on separate Confederate Memorial Days. They take place on different dates in April, May and June. I do not wish to celebrate Confederate Memorial Day and honor my Confederate relatives on these days, not just because I don’t live in the South, but because I do not relate with the Confederate cause. I don’t want to join a Confederate heritage association nor fly the Confederate Flag. I just want to honor my relative’s humanity. With this motto in mind, I choose to honor my Confederate soldiers by learning about their story and feeling compassion for them, yet going forward with my knowledge of their choices to create a more just world. I don’t believe what they believed, but their lives mattered, and I choose to remember them on Memorial Day, the national holiday of remembrance for my country, which I love. A spirit of reconciliation and somber gratitude for the sacrifices made on each side permeated the original celebration of Memorial Day. I want to carry that forward in my own observance. By remembering my Confederate relatives along with my Union relatives on Memorial Day, I show my belief that every story matters. Their story may be different than my own beliefs and my own choices, but that doesn’t mean I should forget them. I hold them in remembrance not only because they are part of my family tree, but because I want to honor the whole human experience by seeking to understand it. Every story matters. What do you think? Should Confederates be considered American soldiers? Should their graves be honored with American flags on Memorial Day? Should we honor them at all on Memorial Day? Please share your thoughts in the comments section. Sign up for our email list and future articles will be delivered to your inbox weekly or as often as each time we post. Confederate soldiers were not traitors. Secession wasn’t illegal. George Washington was a traitor. Had at any time up until the very end of the war the South said we will lay down our arms if you grant us legalized slavery it would have been done. Stop fooling yourself. Confederate soldiers fought for a cause I do not believe in. But I do believe I can honor their lives despite this, in a spirit of reconciliation and because of my belief that every story matters. Not starting an argument here. Just leaving a statement that anyone who calls men of the Confederacy traitors or spouts that they were fighting to maintain the oppression of an entire race of people is misguided and has fallen for the mid-19th century northern propaganda that is still alive and well today. If you want to separate yourselves from the intolerant purveyors of slavery and terroristic attacks on their own people, you must disavow all that was north of the Mason-Dixon line. The South wanted freedom from Northern misdeeds, terrorism, greed, illegal mandates and legislation; NOT the legal continuation of slavery. Most all of my Confederate soldier ancestors never owned another person in their entire life. What then were they fighting for? Many non slave owning whites of the CSA were fighting for the southern economy and way of life, which was built on slavery. They also wanted to maintain their status as superior to black people. Confederate Soldiers were first and foremost Americans, our countrymen had a disagreement on the running of the country–so they fought. We should honor them because to honor them is to honor the American spirit–the same spirit that made us go to war against England, also over the running of our country. I think that is a very fitting. Thank you Margret. Confederate “soldiers” were enemy combatants who killed US Army and Navy personnel……personnel who were defending the United States……this is the day set aside to honor THEIR sacrifice….and those of the US military that died in the wars that followed…. And yes I am a retired 32 year veteran of the United States Air Force…..so I take great exception to folks who think anyone but forces that died DEFENDING OUR great country should be honored on this day…. You point out that how the graves were treated changed in 1898 for political and strategic reasons. The public statement by McKinley that you quote does not refer to those reasons but changes the topic to something more palatable. I will concede that coming out and stating that the country would decorate the graves of those already dead if only more southerners would come out and die for another cause wouldn’t have been as persuasive. But at this point in time we need to be aware of the totality of the issues being addressed. Today, with the public associations of white supremacy with the Confederacy, and with full awareness that those soldiers died to uphold slavery, whatever their personal thoughts were, it is time to consider the public monuments erected across the south that glorified the leaders and soldiers of the Confederacy. I believe in remembering our families. Our history. Fully. I will never know the personal beliefs or goals of my ancestors long dead. But I can discern the effects of their actions. I love the pie safe my Confederate gggrandfather made that sits in my kitchen. I love the respect and laughter his grandchildren showed when speaking of him. I love the photograph I have of him that shows gentle, deep eyes. I know that in a border state which side the soldiers fought for could easily depend on which side showed up at the door and enlisted men at gunpoint. But I will never honor his service to the Confederacy. For that matter, nor did he. Thank you for sharing such a thoughtful comment. I am glad that you brought up the current problems with white supremacy and the Confederacy. That is certainly one of the issues that makes this topic so difficult. Live your life as you wish. My heart became content only when I took the time and effort to study the history of The War of Rebellion, which happens to be the name used by the Union on official documents. Might doesn’t always make Right. The history I learned from textbooks has been proven to be more myth than reality. After the War, three different special prosecutors were appointed to prosecute Jefferson Davis as a traitor. All three of the best legal minds of the day came to the same conclusion. If evidence were submitted under oath the Confederacy had every Right to secede and Lincoln should have been tried as a war criminal (of course he was dead). America was the ONLY nation in the World to go to war to supposedly end slavery. Why? Brazil had ten times the number of slaves as America, yet they settled the issue with no violence and continue to have few racial problems. If Lincoln had only been willing to negotiate, the greatest upheaval in our history could have been avoided. Edification will do wonders for your soul. Good luck. For many years prior to the war, our nation’s best and brightest minds strove to end slavery without violence. When Lincoln was elected, the southern states seceded, they formed the Confederate States of America, and attacked Fort Sumter. The Northern states fought to preserve the Union, and the South lost. There is no way Abraham Lincoln would ever have been tried as a war criminal. Grew up in northern Louisiana in the 50s & 60s but had two “Yankee” parents and as Bohemian surname so kinda stood out as not being a true southerner. Attended Robert E Lee Jr High and one of the high school football teams was called the Rebels. Memorial Day was considered a “Yankee holiday” and wasn’t mentioned much less celebrated. Even after I married and my son moved out to California after graduation, we were in a Wal-Mart a week before Memorial Day and I made the comment that they sure put out their Fourth of July decorations early! They were for Memorial Day. Even when it became a federal holiday, all that meant was “no mail” that day as we were already out of school by that time. A whole different perspective because of where I was raised. I thought Louisiana was a part of the United States …..it is isn’t it? Hopefully, you do appreciate it…. Memorial Day was not a National holiday until 1971. I live in New Zealand where we had the Maori wars. My relatives fought on both sides, In fact one of my Maori relatives in a chief. I celebrate and recognise both sides of my family, pakeha(white) or Maori. They made me what I am today, a proud New Zealander. Confederate soldiers KILLED more members of the United Statea military then were lost in WW1 & 2, Korea, Vietnam, Iraq, and Afghanistan combined. Their forces started the conflict similar to the Japanese surprise attack on Pearl Harbor……cowardly attaching Fort Sumner…. Memorial Day is a day to honor lost US military forces who PROTECTED the UNITES STATES of America against all forces…foreign and domestic…..like the oath military members take…..
By public law, enacted on May 23, 1958, Confederate Soldiers ARE American Soldiers, and should be regarded as such. Those US military members are the ones honored today along with the dead from WW 1 and 2, Vietnam, Korea, Iraq, Afghanistan,…….NOT the enemy combatants that killed them!!!!! Why ask a question and then reply to it in a negative manner? So much for really wanting an objective answer. These men fought for what they deemed the best for them and their families. Slavery was a bad thing, but it was not what the war was totally about.Slavery would have ended on its own accord, if the North had not been so self-righteous. Read more about the times and what the industrial North was attempting to do to the rural South. That is the real reason for the war that came about. See what that same industrial North did to the broken South. Were their actions justified in what they did to the Southern states that were devastated? Were they so enlightened ? Yes, there is still resentment. Some one mentioned Washington and the Founding Fathers. How do you think England felt about them? Would they have enacted the same retribution on the Colonies if they had won? Yes, the Confederate should be remembered. They fought in the same spirit that colonists did. They should be remembered for that, proudly. Remember, victors get to write the history that is studied. I am not debating with anyone about slavery or why they took up arms…..I am not accusing confederate “soldiers ” of being traitors. I am not trying to change history or dispute why certain things happened as they did. I am simply pointing out Memorial Day is to honor the members of any branch of the UNITED STATES military who sacrificed their lives in the defense of our great nation. Those graves In the picture above are filled with the remains of US Military members who gave their lives against enemy combatants….i.e. Forces that take up arms against the US military with the expressed purpose of killingly or wounding them. Confederate forces took up arms against the US Army with that expressed purpose …. We can not honor the dead who died defending our nation and honor their killers also….. Thank you for your thoughtful post. I don’t take a firm stand on the issue raised. I am of two minds. I agree in honoring our ancestors despite our lack of agreement with their actions. And I am concerned that honoring Confederate soldiers is too connected today with white supremacy which promotes racism and hatred. Such a dilemma. Follow the $. See the “Morrill Tariff”. New Orleans had surpassed New York as the center of trade in this Country. The year before the War, New Orleans shipped 4.5 Million bales of Cotton from her Port. You can’t Tax what you don’t control. Less than 6% of Southerners owned Slaves. BTW, Northerners owned slaves too. The first person to sue for the right to own Slaves in this Country was Black. 30% of White Males in the South between the age of 18-40 gave their lives fighting against the attempt by North to dominate them. 600, 000 men lost their lives in this struggle. Blacks fought on both sides of the War. Check the FACTS! If you look at the secession documents, each state says that they are leaving the union because they wanted to preserve slavery in their state and in the western territories. This simply isn’t true… of the states that seceded, I am only aware of two or three that explicitly listed slavery as an issue of their secession. The documents are available… I would also remind you that slavery was a legal institution in the US at that time… as well as during the entire war. You are suggesting that the war was fought over an institution that was and remained legal throughout the entire war. That makes absolutely no sense at all, and is very disingenuous. I would recommend that you read some of the dialogue that occurred during the Lincoln/Douglas debates prior to the election… Lincoln was very open about his beliefs about blacks and whites. It amazes me that he gets a ‘mulligan’ on his words. Furthermore I would suggest that you read about what Lincoln wanted to do with the freed slaves. I would recommend that you read the Emancipation Proclamation… for no other reason than to see that Lincoln offered any of the seceding states the opportunity to rejoin the Union and KEEP their slaves. Furthermore, a good reading of the Emancipation Proclamation reveals that paper did absolutely nothing to free anyone… anywhere. Then there was the Corwin Amendment… you should read this. Then read Lincolns’ ‘War Aims Act… 1862, if my memory is correct. It repeatedly states that the war was all about preserving the Union. I have the conundrum of having a family member that was a noted abolitionist… that owned slaves. Bless his heart. I would also suggest that you read about ‘The Devil’s Punch Bowl’… an event that happened in Natchez, MS and involved the great mis-treatment of freed slaves at the hands of Union occupying forces. To totally understand what that war was really about, one needs to start reading and studying Thomas Jefferson and the Founding Fathers. Would I honor my Confederate fallen dead on Memorial Day? Sure I would. I think many confuse secession with the war that followed. The slavery issue was certainly part of secession, however the war was about the northern invasion. No one died at Ft Sumter. The killing did not start until Lincoln invaded. Most Confederate soldiers were very poor (85% illiterate) and certainly did not own slaves. Soldiers from Texas did not leave their families alone on the world’s most dangerous frontier, walk most of 2000 miles and fight and die for 4 years for the 4% who owned slaves. Look at the changes the South made to their constitution: term limit on president, limited welfare, no riders, each bill about only one subject, no bill add-ons, no earmarks, Post Office had to be self sufficient, etc. That is why they seceded. Slavery was legal long before their was a Confederacy. After the war many Confederates fought for the US again (Indian Wars, Cuba, Spanish-American War, etc. Congress declared them veterans. Honor ALL vets on Memorial Day.